I’d already set up my Christmas cards when I found out that Shutterfly was offering this great deal for bloggers to get 50 of their beautiful holiday photo cards. So I thought – in the true giving spirit of Christmas (ahem) – that I’d see about helping my parents set up their very first Shutterfly cards for the holidays. Every year, my mom talks about having photo cards printed, but then she’s intimidated by the process and quits before she even gets started. I think the last photo card she sent for Christmas used our family photo from my wedding – and I’ve been married for nine years. After Junius was born, I started using Shutterfly for making photo books (they have the best options for designing your book of any photo site I’ve tried) – as a second child, poor Pippi doesn’t have any yet, but I have two really beautiful books for Juni. Last week, I set up our 2011 calendars on Shutterfly (shh… I'm giving them as gifts, but keeping one for myself). I'm also considering using Shutterfly for Pippi's birthday invitations in February. Despite having used Shutterfly for so many photo projects, this is my first time trying them out for holiday cards. I'm really impressed with the range of designs available now – and I’m not just saying that because of the deal they’re offering. Whether you want one photo or five, traditional or funky, they’ve got plenty of styles to choose from. Because we actually have ONE recent photo with my parents, my brother, my husband, my kids and me ALL in it AND looking in the general direction of the camera (and did I mention that my dad’s eyes are open, too? ), we'll have to use an option with only one photo. Personally, I like the fun designs (check out With Glee or Antique Ornaments), but I think my parents may want something a little more classic – maybe Stirling Snowflake or Classic Flourish. Tonight I'll set up a few different options for my mom and show them to her tomorrow. Cross your fingers that we can actually make this work! Then head over to Shutterfly and get your cards and holiday shopping done in one easy place. This post was sponsored by Shutterfly's holiday card promotion -- but you can still trust that the opinions expressed here are entirely my own. 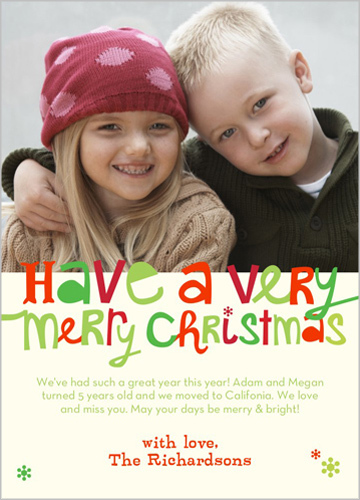 Also, the kids in the photo of the card shown are not mine -- but they are cute. So when I wrote about how successful we'd been with get Pippi to sleep in hotel cribs, evidently I missed one critical step. Pay close attention now, because it seems there was a fatal flaw in my plan. When you reserve your hotel room and request the crib, you have to specify that by "crib" you mean an actual crib. Not a pack-n-play. Because apparently, if you don't clarify that seemingly obvious but critically important detail, you might get a pack-n-play. And when you get to your hotel room with two tired kids and your exhausted selves and the hotel desk clerk brings you a pack-n-play, your husband will have to politely but very firmly explain to the bewildered clerk why that pack-n-play is completely unacceptable. Then said clerk will desperately call other hotels in the area asking to borrow an actual crib and your husband will have to drive to a nearby hotel to pick up the crib because the clerk is the only person working at the hotel and can't leave. And you'll be disappointed all over again when your husband calls from the car to say that the other hotel thought they had a crib, but turns out they only have pack-n-plays, too. So you'll cram your almost-three-year-old into the pack-n-play, where she can't stretch out all the way because she's longer than the available space. You'll explain to her that it's not a good idea to keep climbing out and then jumping back in from the bed. And you'll cross your fingers that maybe you'll all get two or three hours of sleep before she climbs out and refuses to sleep any more. 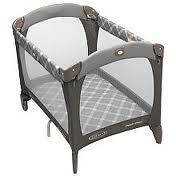 If you know anyone at Marriott, please teach them the difference between a crib and a pack-n-play. And say a prayer, y'all. It's going to be a long night. Image borrowed from Traveling Baby Company, which seems like a great idea if they're where you are. Today's post is part of the inaugural Blogging Friends Road-Weary Traveling Tips Compendium, founded by Evelyn at Momsicle. If you're traveling for the holidays this week (or even if you're not), you'll want to check out the other bloggers linked below who are offering great tips today. We're fortunate to live in the same state with our parents -- close enough for a day trip now and then. But we still find ourselves needing to spend the night away from home, either visiting friends and family or taking a vacation. And the hardest part for us has consistently been sleep. We moved Junius to a big boy bed when he was two, so he's been the easy one. And when Pippi was a baby, she survived in the pack-and-play okay for a while. Then we took her to stay with friends in Charlotte. She had just turned two years old -- still sleeping happily in her crib at home, but probably too big for the pack-n-play we parked at the foot of our bed. She tossed, turned and sobbed all night. "I go home. Seep my crib," she wailed. It was so pitiful. She was miserable, we were miserable, no one slept. We left after lunch the next day to avoid another disastrous night. For months after, we simply didn't travel overnight. But then there were vacations and other trips we couldn't pass on. And thus began our trial-and-error approach to solving the Pippi problem. The very cute toddler-sized air mattress with built-in princess pink sleeping bag was not the answer. She loved it when I pulled it out of the box, wouldn't get off of it when we inflated it in, snuggled right into the sleeping bag when we zipped her up. And then she was done with it. Took forever to get her to sleep, then we found her like this (photo above) an hour later. She's sound asleep in that picture -- on the floor, with her head on the mattress. We slid her back into the sleeping bag, but she was awake and in our bed an hour after that. Putting her in the trundle bed at her grandparents' house next to her brother was not the answer. They talked and giggled and wouldn't go to sleep. They switched beds back and forth. And in the middle of the night, when we thought they were finally sleeping, she hopped up, ran into the living room and retrieved a pile of toys to take back to her bed. She ended up in bed with me and her daddy slept on the trundle with Junius that night. Same scene, different day at the other grandparents' house when we tried putting her in the twin bed (with rails on both sides) beside her brother. Tucking her into the queen- or king-sized bed with us meant she eventually slept -- but we didn't. She rolls around, throws elbows and kicks in her sleep. Oh, and she wakes up at the crack of dawn, ready to play. And finally, the solution. If she sleeps fine at home in her crib, then get a crib. Duh. On a weekend trip to Virginia Beach, we asked the hotel to set up a crib in our room. Worked like magic. She slept so well, we didn't even mind when she woke up smiling with the sun at the foot of our bed and sang out, "Hi Daddy!" Later in the summer, we stayed with a friend who still had a crib in storage -- magic again. And on our end-of-summer beach week, we rented a crib from one of those places that rents beach chairs and umbrellas. Ta-da! Even at naptime, it worked like a charm. I realize we'll have to move her to a bed at some point -- but I've decided not to sweat it until she turns three. And Thursday night, she'll be in another hotel crib, hopefully sleeping soundly after a wild day of playing with the cousins and eating too much dessert. If you want to join in the fun, leave your tips in the comments here or write your own travel tips post and leave the link in the comments. It's been several months since I wrote about any children's books at my house, so seems like a good time to share some of our recent favorites from the library. There's no real theme to this list, but both of my kids have enjoyed all five books. Sometimes I catch myself reading car books only to Junius and doll books only to Pippi -- then discover that they both like listening to "boy books" and "girl books." It's a good reminder not to pigeon-hole their reading interests so early. If you're looking for other suggestions of children's books to buy for holiday gifts, check out the blog's "books" category -- it's mostly books for kids, but there are some grown-up titles thrown in, too. Roy Makes a Car by Mary E. Lyons and Terry Widener based on a story collected by Zora Neale Hurston: If you're a fan of the writing that came out of the Harlem Renaissance, then you must have this book. If you have no idea what I'm talking about, then you'll still enjoy the great illustrations and the clever story in this book about a man who can make a car fit for the angels. Fanny by Holly Hobbie: From the author of Toot & Puddle comes this sweet book about a girl named Fanny who makes her own doll after her mom says she won't buy a "Connie" for the her birthday (Connies look like a scary cross between Barbie and Bratz dolls). Fanny's doll comes to life in a lovely way and reminds Fanny that girls can be more than just an overly-stylized, pretty face. Pssst! by Adam Rex: The concept, the dialogue, the illustrations, the style... everything about this book is funny and clever. But what sold me completely was the chuckle that bubbled up from Pippi the first time we got to the part about the sloths. You'll have to read the book to find out what secret project these zoo animals are up to. Sunny Boy: The Life and Times of a Tortoise by Candace Fleming and Anne Wilsdorf: Inspired by the true story of a tortoise that went over Niagara Falls, this silly book follows a tortoise named Sunny Boy from his early peaceful life to death-defying adventures with a daredevil named Biff. There's also reading Latin, collecting stamps and growing orchids. Somehow, it all works. The Year of the Perfect Christmas Tree by Gloria Houston and Barbara Cooney: Yes, it's too early for Christmas books. But the kids picked this one out and it ended up being really sweet. The illustrations are lovely and the sweet story, which takes place in 1918, tugged hard at my mama-heart-strings. It also takes place in the North Carolina mountains and references details familiar to those who know the area. As always, all links take you to Quail Ridge Books & Music -- it's the best independent bookseller around, but you can order from their website if you don't live close enough to wander in. They don't compensate me in any way for linking to them. I just love them. Despite my earlier whining complaints (and because of the store's responsiveness to changing the floor plan), I've grown to like my new Harris Teeter -- it's super close to my house, the customer service is great and the covered parking is a life-saver on a rainy day. Oh, and they keep sending me $10 coupons each month, so who am I to say no? On Tuesday, Pippi and I were on our way through the parking garage toward the store, when I noticed a young-ish man who had just closed the trunk on his BMW after unloading his grocery bags. He then carefully pushed his empty cart between his car and the car next to him, parking it against the wall between the parking spaces. The man was alone and did not appear to be in a hurry as he climbed into his car. The cart corral (photo above) was two spaces away. I mean, really, was it THAT far to walk? With no screaming baby or wild toddler pulling on your arm? Were you just so worn out from being cool that you couldn't make the trip? 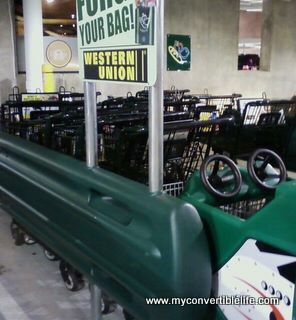 Or were you staging some sort of quiet protest against people telling you where to put your cart? Because I'm pretty sure it took you longer to slide that cart in beside your car without scratching it than it would have to just put it where it belonged. And now everyone else is going to be jittery about parking in that nice space you just vacated. Okay, I'm done. And I realize that I've got a pretty easy life if this is the worst thing I have to complain about. But a pet peeve is a pet peeve, and this one's on my list. So tell me -- what's annoying you these days? P.S. In the interest of full disclosure, I must confess that after I finished giving the man my worst stink eye, I proceeded to violate my own rule about not using a double-seater cart when you only have one child. But they have a lot more of those rocket ship carts now than they did at the old store, so I've rationalized that it's okay. Mea culpa. Is it lame to start off an acceptance speech with an apology? 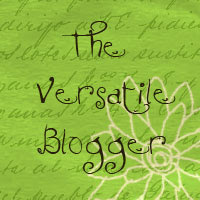 I hope not -- because I want to thank Pam and Brenna for honoring me with The Versatile Blogger award and I need to apologize to both for taking many weeks to write this post. It is an honor, right? Not just a scam for writing a list post? I mean, there's prize money in the mail, right? Regardless, you should help me recognize both of these ladies by clicking through to their blogs: My Pamtastic Life and Suburban Snapshots. I discovered Pam through her very kind Twitter encouragement of my Couch to 5K running program, and you may already know Brenna from her brilliantly famous Why Having a Toddler Is Like Being at a Frat Party post. I'm going to assume they both think I'm a Versatile Blogger because I write about a broad range of topics including school board politics, strategies for poop, home remodeling, recipes, children's books and pole-dancing. Guess I need to work on my niche. In keeping with the rules of the award, I want to officially thank Pam and Brenna for reading, commenting and tweeting with me, even though they've never met me -- and for their great contributions to the blogging world. Below you'll find a list of several random things (depending on the award-giver, it's either supposed to be 7 or 10 things that I like or things about me) and a list of (up to 10) deserving, new award-winners. I have an extra kidney (sort of). As a kid, I broke my left arm in four places by jumping off a swing set. I could eat cereal and milk for three meals a day. I prefer not to wear socks, except with running shoes. That's one of the reasons my husband loves me. I get more nervous at the eye doctor than I do at the dentist. People tell me I look just like my mom. Growing up, I never knew what to say when people told me that. Now I think it's a compliment. I've never smoked cigarettes. Or anything else for that matter. Congrats to you all -- now go spread the love! We got a lot of eggplant in our Produce Box this fall. Since my kids and I are not big fans of eggplant parm, I needed another easy option for using it. A quick Google search revealed this recipe from Eating Well, which includes one of my favorite ingredients: feta cheese. I took it to a bloggy ladies event and it was a hit. My kids don't love it, but I do -- served with pita chips, it's a great substitute for lunch. Here's the recipe, with my substitutions and notes added. • 1 medium eggplant, (about 1 pound) -- I usually had two or three smaller eggplants, which worked fine. • 1/4 cup extra-virgin olive oil -- Depending on the size of your eggplant, you might need less oil. • 1/2 cup finely chopped red onion -- Red onions would probably be better, but I used whatever white or yellow was in the fridge and they worked fine. • 1 small chile pepper, such as jalapeño, seeded and minced (optional) -- I skipped this. • Pinch of sugar, (optional) -- I added this. It's helpful if your eggplant is a little bitter. Put lemon juice in a medium bowl. Cut the eggplant in half lengthwise and scrape the flesh into the bowl, tossing with the lemon juice to help prevent discoloring. Stir in feta, onion, bell pepper, chile pepper (if using), basil, parsley, cayenne and salt. Taste and add sugar if needed. Serve immediately, or cover and refrigerate for up to 2 days. I actually kept mine longer -- it's not as pretty, but still tasty. In the past month, I've spent more time in more medical office waiting rooms than I've ever visited in a four-week period. Dentist. Optometrist. Allergist. Orthodontist. Dentist again. Pediatrician. Gynecologist. Urologist. Radiologist. Dermatologist. Urologist some more. As a result, I've learned that: no one in the family has a cavity, my contact lens prescription is the same, Junius is still allergic to peanuts, I qualify for invisalign, both kids qualify for the flu mist, my UTI wasn't actually an infection, I need to stop drinking cranberry juice because it's a bladder irritant, I don't have kidney cancer and my skin is clear. Oh, and I was born with three functioning kidneys. That, my friends, is known as burying the lead. Okay, so it's not exactly three full kidneys -- more like one full one on the left and two half-kidneys working together on the right. But it's funnier to say that I have three kidneys. According to the urologist it's an "anatomical variant." 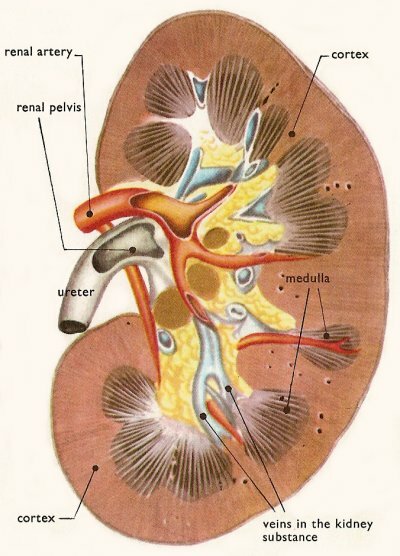 Turns out that my left kidney is all normal with one ureter, but my right kidney has two parts with two ureters connecting to my bladder. Yeah, I know, really not the same as three kidneys -- but again, SO much funnier to say. KidsHealth.org says it's something that happens in about 1 in 125 births. In my case, it's not really a big deal, except that it means I'm more susceptible to infections. So I'm drinking lots of water, eliminating tea and soda (sniff, sniff) and hoping for a healthier month ahead. There you have it. That's what I've learned this week -- what's your news? Image from The Internet Encyclopedia of Science. I'm cleaning house today -- trying to sort through the six-families-worth of toys that we own so we can clear out the den before the renovation project starts on Tuesday (yikes!). Okay, technically right now I'm blogging, but I had to take a quick break to capture this moment. Pippi is "helping" me. She's wearing a polka dot dress, the stripper shoes, a frilly apron, a cupcake hair bow and an assortment of plastic jewelry. I am similarly decorated (plastic jewelry and a butterfly hair bow, of course), although I'm barefoot and wearing sweats. She finds a plastic earring and asks me to clip it to her belly button -- when that doesn't work, we clip it to her diaper in the vicinity of her belly button. And while I attempt to sort toys into piles that will get them out of the house (or at least out of the den), she's pretending to be my doctor by peering into my ear with her plastic compact mirror. Periodically she stops to dance to the mix CD that's playing and shake her UNC pom poms along with the music. Then she moves on to doctoring Elmo. It would be a whole lot faster to do this clean-up project alone. But it wouldn't be nearly as entertaining. Glasses courtesy of Daddy's co-worker. Because not every cool Halloween treat has to be candy. who completed the Climb for Life with 50 extra pounds of gear. That's 56 flights of stairs. Batman tries out the violin before the NC Symphony kids concert. Even superheroes need a talent. then are surprised when the bowl grabs back.